Severe storms swept through the mid-state Friday night bringing large hail and damaging winds along with them. The storms hit several counties including Cumberland, Putnam, White and Clay counties. Tornado Warnings were issued for those counties around 8:45 p.m. Multiple reports of trees down were made in those areas and the power was knocked out at the Clay County 911 center. 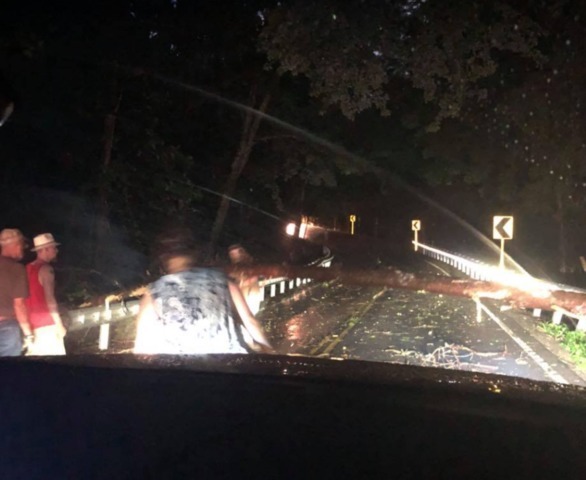 Multiple trees were downed in Jackson County, like this large tree that fell over a road. Calls in the area were diverted to the Overton/Pickett 911 Communications Center. Large golf-ball sized hail fell in Tompkinsville, Kentucky. Putnam and Cumberland county also saw serious hail. Fentress County Emergency Management officials reported minor roof damage to a house in Jamestown off of Hwy 52 East as well as some trees down.